Abstract: This thesis investigates nonlinear effects in semiconductor waveguides for optical signal processing. Two semiconductor waveguides are studied : nanoporous silicon waveguide and GaAs/AlGaAs waveguide. 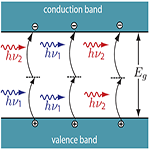 First, nonlinear optical properties of nanoporous silicon waveguides including two-photon absorption, self-phase modulation and free-carrier effects are characterized and compared with similar measurements conducted on conventional silicon-on-insulator waveguides. Then, we experimentally demonstrate 10-Gb/s wavelength conversion using cross-amplitude modulation, cross-phase modulation and four-wave-mixing in GaAs/AlGaAs waveguides. Finally, we propose an ultrafast optical sampling system based on non-degenerate two-photon absorption in a GaAs photodiode. Using this technique, we successfully demonstrate a background-suppressed measurement of quasi 4-Tb/s eye diagrams.